Strong, sweet odor and taste. Phenomenal results when used as an odor attractant, "honey burns", or when mixed sparingly with oats. Sweet Tooth's scent and taste is extremely attractive to all bears. A little goes a long way. Regular honey has very little odor quality. Sweet Tooth has the strong, sweet odor bears love. Strong, sweet odor and taste. Phenomenal results when used as an odor attractant, "honey burns", or when mixed sparingly with oats. 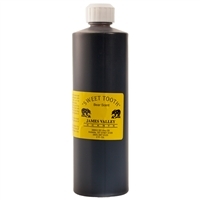 Sweet Tooth's scent and taste is extremely attractive to all bears. A little goes a long way. Regular honey has very little odor quality. Sweet Tooth has the strong, sweet odor bears love. A very attractive "long distance call" lure for bears. Made with a very long lasting fish oil base and a combination of "smells" that will attract bears from long distances. Apply to a scent holder and leave at bait stations. 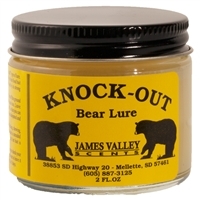 Knock Out is the most powerful and the hardest-hitting bear attractant ever produced. This product is very attractive to black bears. Use to quickly open new baits, freshen existing ones or while stand hunting. Knock Out is a great predator attractant that is very attractive to all carnivores. One bottle will open 8-10 baits. Strong stuff - a small application goes a long way. A powerful long distance call lure packed full of "loud", heavily tainted beaver meat (mmmmm, yummy!) and secret calling materials that really make blackie's "roll". Promotes quick and aggressive hits at bait sites. Comes in a long lasting heavy paste form. Bears absolutely love this bait/scent. Bruin Buster has a strong and pungent odor that reaches out and around a vast area! There are no natural attractants available that are more attractive to bears than Bruin Buster. This is it!! A powerful long distance call lure packed full of "loud", heavily tainted beaver meat (mmmmm, yummy!) and secret calling materials that really make blackie's "roll". Promotes quick and aggressive hits at bait sites. Comes in a long lasting heavy paste form. Bears absolutely love this bait/scent. 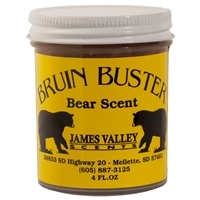 Bruin Buster has a strong and pungent odor that reaches out and around a vast area! There are no natural attractants available that are more attractive to bears than Bruin Buster. This is it!! This hot sexual exciter and attractant really turns on those big old boards. The strongest bear sow in heat lure available. An added benefit to any bait or stand hunting situation. Passion ingredients are added to make this lure excite all predators. Should be used on baits that have big boars visiting them. This hot sexual exciter and attractant really turns on those big old boards. The strongest bear sow in heat lure available. An added benefit to any bait or stand hunting situation. Passion ingredients are added to make this lure excite all predators. Should be used on baits that have big boars visiting them. A Territorial/Sexual Lure that contains Boar Bear internal glands and black bear sow estrus urine. 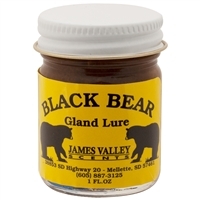 Use Black Bear Gland Lure at established baits. This lure makes bears think they have new competition at the bait as well as "triggering" the sexual urge. This attractant entices nocturnal boars to come to the bait earlier and more often. Copyright © 2013 The James Valley Company, Inc. All Rights Reserved. Built with Volusion.